Amenities – Woodlake: Life on the Lake! With over 13 miles of trails, 16 playgrounds, 3 outdoor and 1 indoor pool, 19 tennis courts, 3 volleyball courts and a basketball court, there’s an abundance of recreational activities at your disposal. 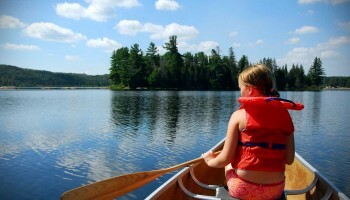 From paddleboards, kayaks and pontoon boat rentals, nature and relaxation is just a step or two away! 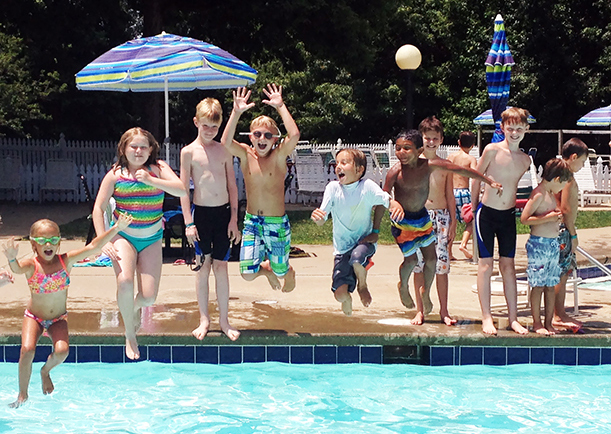 During our busy holiday weekends, we ask you to please walk to one of our outdoor pools if you are able to do so. We do not have ample parking and would like to avoid parking on Woodlake Parkway this Memorial Day weekend. Outside alcohol is not permitted at any of our locations and coolers are subject to inspection. 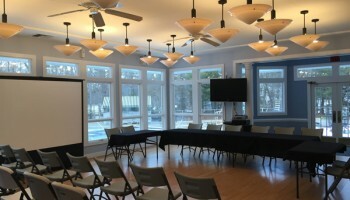 The Woodlake Community Clubhouse is located at our Swim & Racquet Complex and is available for rental year round. 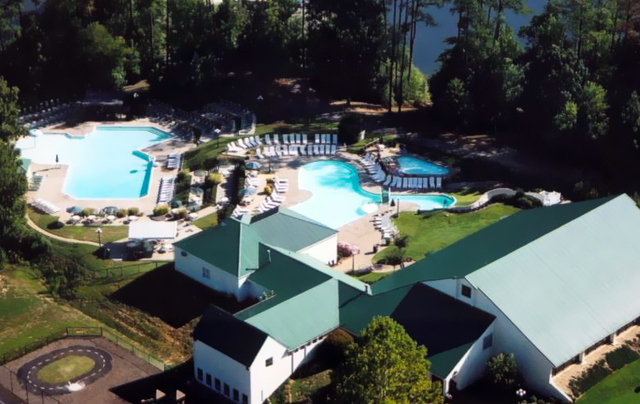 Woodlake residency or membership is not required. It’s perfect for business meetings, holiday parties, special events, and any get together. 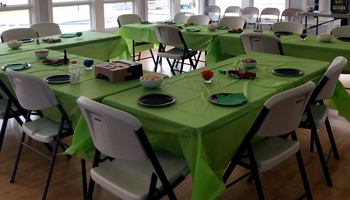 The room comfortably holds up to 54 people seated or 125 people standing and we have tables and chairs available. A deposit of $300 is required to reserve the clubhouse. Deposit is returned in full if the area is left in clean, undamaged, satisfactory condition after the event. EAST WEST LEGACY PARK offers some of the most beautiful views of the lake...perfect for a birthday party, neighborhood party, company picnic, family reunion or wedding. The park offers a covered picnic shelter which includes picnic tables, barbecue/fireplace, large grassy area, lights, electricity, and a large, covered amphitheater/stage area, all overlooking the water. Reservations are taken year round. At all other times, the pavilion is available for residents' use on a first-come, first-served basis. **Must be rented and paid for by a resident. ***Deposit is returned in full if the area is left in clean, undamaged, satisfactory condition after the event. Share the sights of Woodlake's stunning shoreline with friends and family! Our famous pontoon boats are very popular for entertaining out-of-town guests or celebrating an anniversary, birthday or get-together with friends. Each pontoon is operated by a specially trained WCA Pontoon Boat Captain and carries up to 14 people. The passenger limit is strictly enforced, with each individual counted - adults, children and infants. Boats are available for rent seven days a week. Both boats sail as early as 9:00 AM and are available to cruise up until 11:00 PM! Saturday Morning cruises require no reservations. Pontoon reservations may not be made at the boat house, directly through a captain, or online. Fishing is not allowed on WCA pontoon boats. Woodlake residents and their guests may take this cruise, departing from the Boat House every Saturday at 10:00 AM, June through August. Passengers will be taken on a first-come, first-served basis, (14 passenger maximum) and treated to a 90-minute scenic cruise on the beautiful Swift Creek Reservoir. $5 per person. You must go to AFC front desk to check-in and pay. Please keep the receipt to show your captain before going on the cruise. Food and drinks are permitted. Photo ID with Woodlake address required for one member of your party. 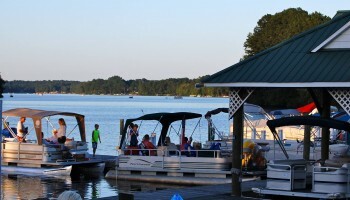 The WCA operates a boat rental program from Memorial Day through Labor Day. 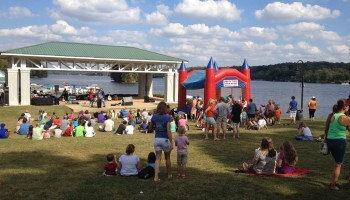 The boathouse is located on the lake between the neighborhood of Shelter Cove and East West Legacy Park (the Pavilion). No reservations are required or accepted. The rental program provides several types of boats for rent. The WCA fleet includes jon boats, canoes, kayaks, pedal boats, and stand up paddle boards. Life jackets, oars and paddles are provided. No gasoline motors are permitted on the reservoir. Boats can be rented to a Woodlake resident or property owner. A boat rental form must be completed and a waiver signed. All boat occupants will be fitted with a life jacket which must be kept on board the boat at all times (per U.S. Coast Guard requirements). The member who signs the rental form is responsible for all damage or lost equipment. Payment is cash, check, or credit card. No alcoholic beverages, glass containers, or pets are permitted on boats. Swimming from rental boats is prohibited. Violations of the above rules and restrictions may result in loss of rental privileges. Woodlake has a dedicated RV lot for homeowners who wish to park their vehicle. Spaces are limited and not guaranteed. 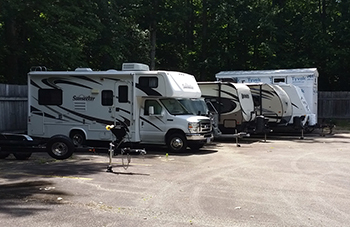 To inquire about parking your RV in the lot, please contact Brian Hoyle at brianh@woodlakeonline.com.